It's been a year since game creator Kenji Eno passed away, but his spirit lives on as his friends and fellow creators seek to make what was his last game proposal a reality. It's been a year to the day since Kenji Eno, musician and game creator passed away from heart failure induced by high blood pressure. Before his passing, though, he approached his fellow game creator and close friend of 18 years, Katsutoshi Eguchi, CEO of From Yellow to Orange, with the idea for a new game. "Last January, Mr. Eno handed a proposal to me and said, 'I want to make this, so I'd like you gather some people for me.'" Eguchi said in an interview with Weekly Famitsu. But before a team could be assembled for the new game, KAKEXUN, Eguchi learned of his friend's passing. "I was quite shaken." Eguchi recalled. "I stayed away from the proposal for a while, but after several months felt 'I can't leave this like this' so I began looking for people to help give form to the idea that Mr. Eno entrusted me with." Eguchi was joined by another game creator and good friend of Eno's, Kazutoshi Iida, and former WARP main programmer and WARP2 CEO, Naoya Sato. Together they are working to take Eno's idea and turn it into a game. The basic idea for KAKEXUN is the utilization of the four arithmetic operations – addition, subtraction, multiplication, and division. The game is described as a massively multi-player "action art SF" for smartphones and tablet PCs. The game is largely divided into two parts. In the initial "Creation" part of the game, Players start out as a force of nature, moving the earth and creating a world of their own through the use of arithmetic. After the world is complete, players can inhabit that world and are tasked with climbing an impossibly high mountain that has formed in their world while communicating with other players. "In this world," Eguchi explained, "the four arithmetic operations are the key to solving the world." 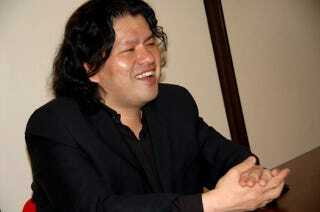 Kenji Eno often pondered his own existence as well as the universe itself. Before his death, Eno had an opportunity to talk with scientists from the National Museum of Emerging Science and Innovation during which, according to his friends, the basis of what all of the scientists' would talk about were numbers and equations. Quantum mechanics and physics were used to describe the universe and Eno's friends believe that the use of arithmetic operations in KAKEXUN may be Eno's way of expressing that way of thought. KAKEXUN currently has no release date. Crowd funding for the game is scheduled to begin starting next month on the 20th.